This free-standing dutch gable double carport has been designed to match the customers home in both style and colouring. It has been framed with Firmlok Colorbond Steel beams, giving clean classic looks and zero maintenance. 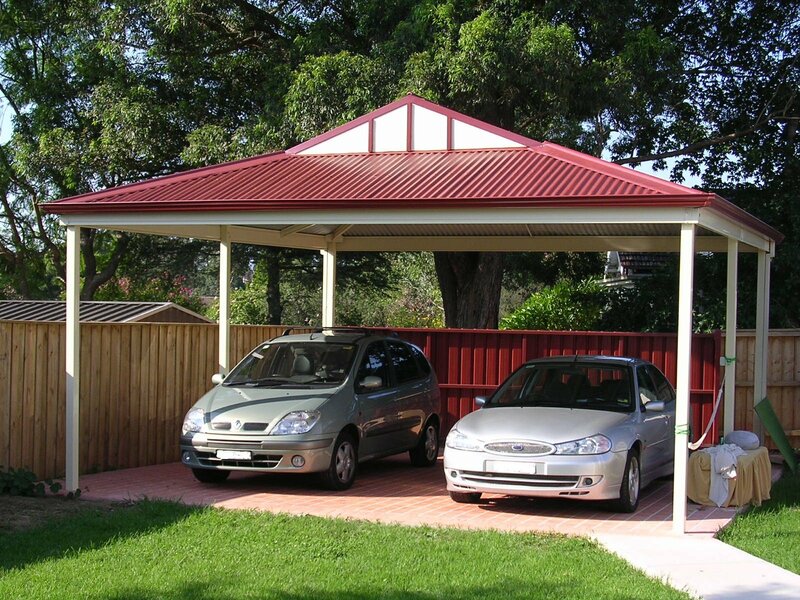 Double carports are usually 6 metres by 6 metres, giving plenty of room around the cars to cater for the Brisbane wet season and allows easy access in all weather. 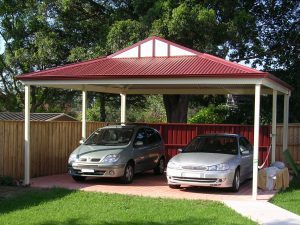 To begin your double carport building process an Outside Concepts specialist will come to your home to discuss your requirements including your preferred colours and styles. Once our detailed proposal meets with your approval, a Brisbane BSA building contract is signed. From there, all Brisbane or Logan Council certification is handled by your Outside Concepts specialist, ensuring all the legal national, state and local building requirements are met. Building can commence once approval has been granted and the construction timetable is discussed with you. Materials are ordered and installation begins, typically taking 5 working days for the carport shown above. Concreting the slab or driveway surface will extend the construction time but with Outside Concepts co-ordinating the entire process, disruption to you and your family will be kept to a minimum. Outside Concepts Brisbane do not use standard building kits; all our carports are custom designed and built to suit your Brisbane home and lifestyle. Why not call or email today, to discuss how we can protect your 2nd biggest investment from the coming Brisbane summer storm season? Phone 1800 601 674 or go to our website (Double Carport Brisbane) for more information.